Politicana | UK & US Politics: Are the headlines turning against Cameron? 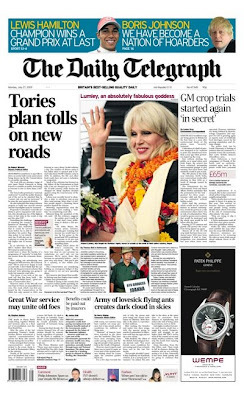 Are the headlines turning against Cameron? The No.10 media bunker will breath a sigh of relief when they check out tomorrows headlines. Cameron and the Conservatives come in for some negative coverage for the first time since..... well, for the first time in a while. 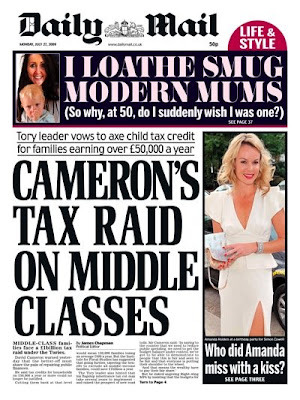 But it is the Daily Mail that really sticks the knife in to Cameron's latest plans to abolish the child tax credit for families that earn over £50,000 - or as they so delightfully put it - 'Cameron's Tax Raid on Middle Classes'. Matthew Paris argued in his column on Saturday that Cameron should use the summer to announce unpopular policies that the Conservatives will be committed to when or if they form the next government. Cameron's rhetoric has certainly shifted in the past few months and there is no longer any holding back when discussing the need for spending cuts after the next election. But will this blunt rhetoric begin to change the media narrative and relatively positive coverage that Cameron and the Conservatives have enjoyed? With the mainstream media all but crowning the Conservatives as the next Government, will they begin to scrutinise their policies more throughly and question their sutiability to form the next government?